Can the iPhone Beat Symbian OS? Symbian on Tuesday released its second quarter financial data. The Nokia-owned company said that it bested last year’s sales mark with 19.6 million units sold. That may seem high, but over the past six months, 159 different Symbian OS-based mobile devices hit store shelves, compared to just a handful from RIM and one from Apple. The most glaring element of Symbian’s release was that it only grew 5 percent over the past year. Considering mobile phone sales grew 12 percent in the second quarter, according to Gartner, and considering Apple is selling 800,000 units each week, Symbian may be losing its grip on the market. But to declare the Symbian OS irrelevant is premature. It still reigns supreme in OS market share and even with stiff competition from Apple, RIM, and soon, Google, few companies have the ability to catch Symbian anytime soon. That doesn’t mean it can’t happen, though. Apple has already sold 6 million iPhone 3Gs in the past two months since launch and there’s no sign of it slowing down anytime soon. 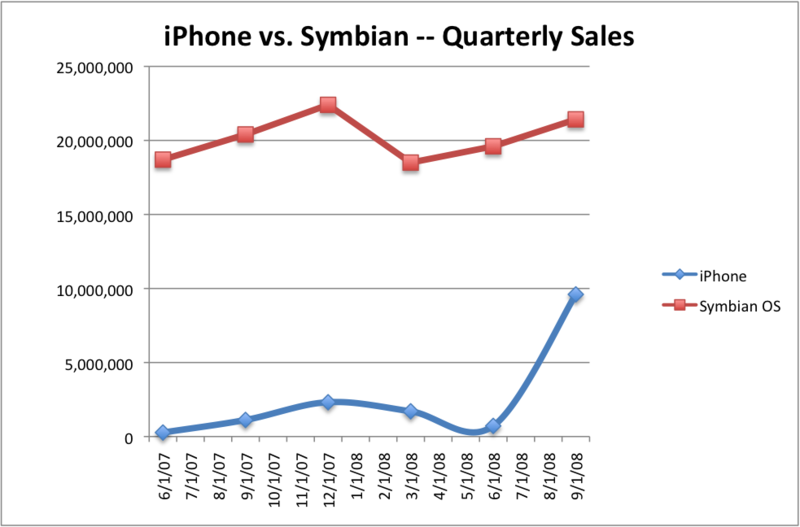 In order to see exactly what would need to happen for the iPhone to overtake Symbian in sales, I considered three scenarios: an annual iPhone growth rate of 300 percent, 100 percent, and 50 percent. To put that into perspective, expected iPhone 3G sales for the quarter ending September 30 this year should be 900 percent higher than last year’s figures for first-generation iPhones, assuming Apple continues to sell 800,000 iPhone 3Gs per week through September. The 300 percent sales-growth scenario is our high estimate, but considering Apple’s growth is 900 percent over the past year, it still represents a substantial deceleration. In order to derive a date for when iPhone sales might overtake Symbian sales, I assume Symbian OS will only grow at 5 percent each quarter, since it is a mature technology. Then I apply the 300 percent growth rate to Apple’s previous-year sales for each quarter subsequent to Apple’s latest. Based on those calculations, the iPhone would be able to supplant Symbian as the leader in the space by October of next year when it sells almost 30 million iPhones compared to Symbian’s 26 million. For the second scenario, I used a 100 percent sales-growth estimate. Maintaining such growth would still be quite a challenge, but once again, it may not be as outlandish as some may think. In this estimate, I used the same growth rate for Symbian as in the first forecast. In this case, the iPhone wouldn’t supplant Symbian until the end of September 2010, when it would sell approximately 38 million iPhones compared to Symbian’s 31 million units. For the last scenario, 50 percent sales growth was used as the estimate to see when the iPhone could conceivably surpass Symbian OS. The same growth rate was used for Symbian, but this time 50 percent year-over-year growth was factored in for the iPhone. Under those assumptions, the iPhone wouldn’t outsell Symbian until the end of September 2012, when it would sell 48 million iPhones in the quarter, compared to Symbian’s 46 million. Will the iPhone eventually beat Symbian-powered phones? Nobody really knows. It might continue to sell at a fast clip and outstrip even the most aggressive estimates or it may slow down and match last year’s first-gen iPhone figures. But one thing is certain: the Symbian OS is simply not selling nearly as well as the rest of the industry and the iPhone 3G is outpacing every other smartphone on the market. Although Apple is expected to sell at least 40 million iPhone 3Gs over the next year, even that may be an understatement.